Aloe vera is probably the most popular succulent houseplant in the world. Here are lots of care & growing tips so you can keep yours as healthy as can be & reap the all the benefits it provides. Aloe vera – oh how we love and need you! Often times called just Aloe, this is a great plant to have around your home. This succulent is truly a plant with purpose and so handy to have in the kitchen or bathroom. 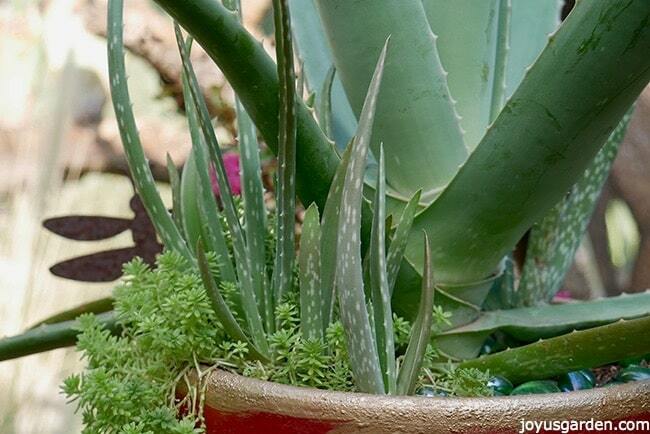 These care tips for growing Aloe vera as a houseplant will help keep yours in tip-top shape. Aloe barbidensis, its fancy botanic name, has been used throughout the centuries for its healing properties. I grew mine outdoors in Santa Barbara and do the same here in Tucson. When I lived in colder climates, many moons ago, I grew it indoors. There are a few important points to know about growing this as a houseplant which I’ll summarize at the end. 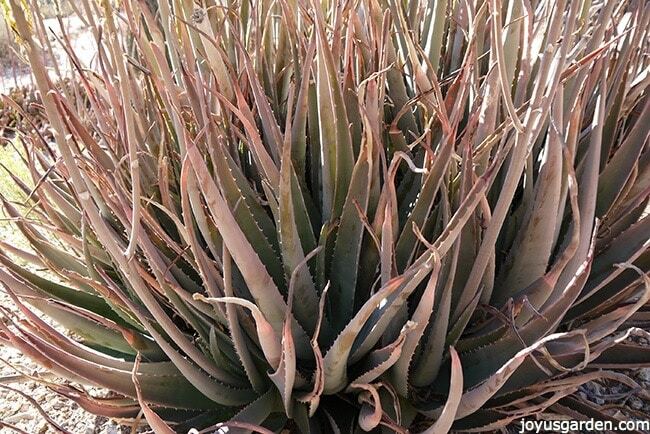 Outdoors, Aloe vera reaches 2′ tall & clumps & spreads. I’ve seen it as wide as 3′. Indoors it grows slower & will most likely max out at 18″ x 18″ although older ones can be even larger. The larger it gets, the heavier it gets because those large leaves store a lot of water & of course the gooey gel. This succulent needs bright, natural light to grow successfully & for those leaves to get nice & plump. A south or west exposure in your home is best. East can be fine too as long as it’s close to a window. You want to rotate it every 6 months or so to make sure the light it’s receiving is even on all sides. In winter you may have to move it to a sunnier spot as the light levels are lower & the days are shorter. In summer be sure to keep it out of any hot, sunny windows because that can burn the leaves. If you have a dark home or apartment, this plant will be a no go. 3 words – easy does it, when it comes to frequency. This fleshy succulent stores a lot of water in its leaves & thick roots. You want to water your Aloe vera every 2-4 weeks, depending on your environmental conditions. Water it thoroughly, perhaps by taking it to the sink, & make sure all the water drains out. A drain hole or holes guarantees this. You never want your Aloe to sit in a saucer full of water so make sure to empty that out too. Water again when the soil is dry or nearly so. The smaller the pot or the warmer or drier your conditions, the more often you’ll need to water. In winter, like with all houseplants, water less. Here’s a post I’ve done called houseplant watering 101 to help you out with that. With this plant, it’s best to water less often than more often. If you Aloe begins to smell, then it’s rotting out. Dark, transparent spots or crimping at the base of the leaves are also signs of too much water. Here’s a good-sized Aloe leaf cut open. You can see all the gel & liquid that the leaves hold. Lack of humidity in our homes can be a problem for other houseplants, but not the Aloe vera. It takes the dry air in our homes just fine. Mine grows outside here in the desert & has minimal brown tipping. 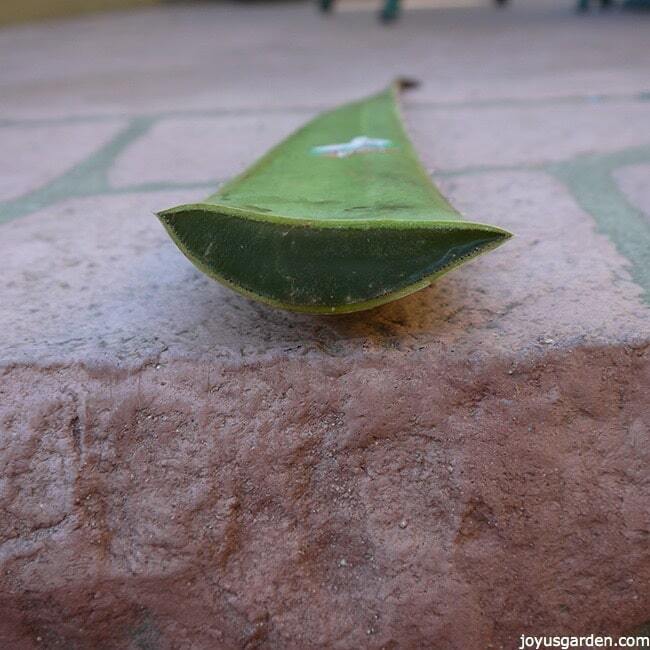 Just avoid misting your Aloe vera – it doesn’t need it & could rot out. If the leaves have gotten dirty & dusty, you can spray them off with water once or twice a year. Just avoid doing this in winter. Aloe vera isn’t fussy or needy in regards to fertilizing. It would appreciate a feeding once a year in spring. I sprinkle a thin layer of worm castings on all my container plants, indoors & out. You could also use a balanced houseplant fertilizer, kelp or fish emulsion. As with any succulent, the water needs to drain out & the roots need to go almost dry before watering again. A succulent & cactus mix is the best because it ensures good drainage & aeration. If it’s in potting soil because that’s all you have, just be sure to water even less often. This is easiest & best done (in my opinion!) by removal & division of those pups. These are the babies which grow off the base of the mother plant. It’s best to wait until the pups are a good size before you remove them because that way the roots are much better formed. I’m doing a post & video to show how to do this very soon so check back in for that. It can also be done by seed but that’s much more time-consuming. I’ve been told that propagation by leaf cuttings is a no go but I plan on experimenting with that real soon. You might have noticed that your Aloe pups are spotted with white while the mother plant is solid green. It’s just how it goes with the babies & they’ll eventually loose that variegation. Anytime is fine to transplant an Aloe vera but try to avoid the winter months if you can. This plant gets heavy as it grows so it can be a challenge with a large one. Don’t rush to transplant your Aloe vera because it actually produces pups more readily when slightly potbound. Every 2-4 years will be fine or when you see the roots coming out the drain hole. My Aloe veras in Santa Barbara always gots orange aphids late in spring or early in summer. I just hosed them off. Mealybugs can also be a problem because they love to hang out in the crevices of the leaves. There’s a mite specific to aloes called the aloe mite but rarely will one get infested indoors. 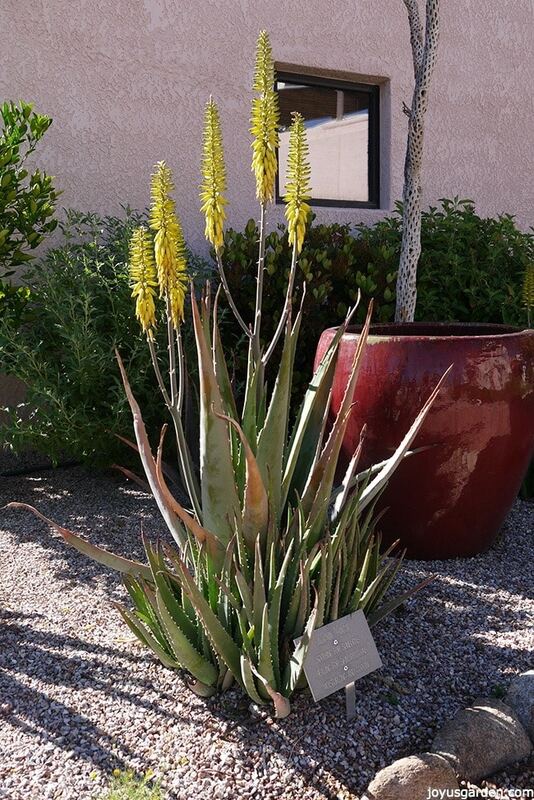 Mine here in Tucson hasn’t been attacked by anything & that goes for the Aloe veras I grown as houseplants. Oh yes my friend, there’s sometimes the bad with the good! One of the problems is rot which I touched on in watering. The plant starts turning soft & then to total mush. If you see the leaves turning shades of yellow, brown or red, this is due to environmental stress. This could be too cold, sun too strong & hot, too little water. This is what caused my Aloe to stress & what I did about it. This is what a stressed plant can look like. The leaves have turned brownish-red due to the strong desert sun & most likely a lack of water. You can see how the leaves are smaller & much less plump than my Aloe’s. Even though this is growing outside, I wanted to show you because something similar could happen to yours indoors. I always take the whole leaf off, all the way back to the base or main stem. Do this with a clean, sharp knife for a clean cut. You can cut just a part of the leaf off but you’ll wind up with a big scab on the end. I think removing the whole leaf looks so much better. Remember, this plant grows slowly so you may have to wait a while before you reap the benefits. There’s a lot of info out there on the net regarding how to use Aloe vera. Here’s how I use it: for burns & skin irritations, as a hair mask, facial moisturizer, as a shave gel & in smoothies. I do none of these on a daily basis but always find aloe to be extremely beneficial when I do. Yes, Aloe veras flower. Mine growing outdoors has produced yellow flowers in late spring as they’ve gotten older. I’ve never had one bloom indoors by the way. Aloe vera needs bright, bright natural light but be sure to keep out of sunny, hot windows. Don’t over water this plant by doing it too often. Let it dry almost completely out before watering again. It’s a succulent! Rotate it every 6 months or so if it’s not getting light from all around. Make sure the mix has excellent drainage. 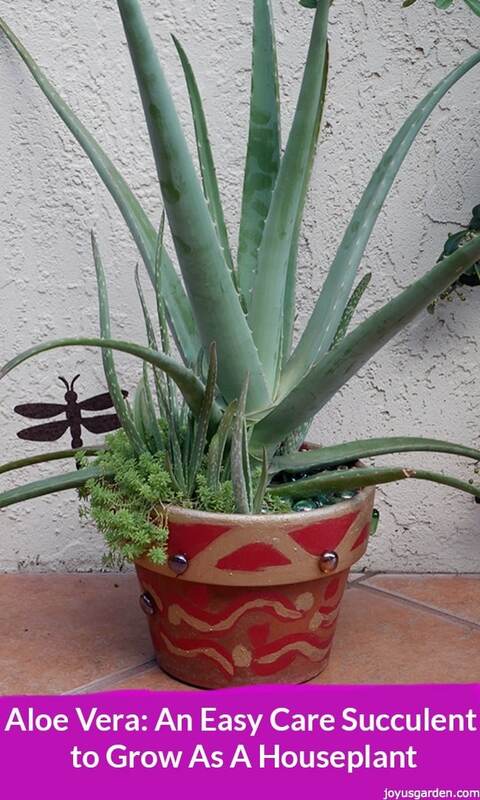 Aloe will do best in pots with a drain hole(s). The yellow flowers of a well established Aloe vera. Aloe veras do just fine in plastic, fiberglass or ceramic pots but I think terra cotta suits them to a T. It’s just a great combo. Your Aloe would love to vacation outdoors for the summer but just be careful it doesn’t get too much rain because it could “mush out”. Aloe vera is in our care guide Keep Your Houseplants Alive if you’re craving more houseplant goodness and guidance. Isn’t it about time for you to get an Aloe vera or 2? If you can’t find them locally, then be sure to check this source out online. Curious if you have any tips…I have one larger aloe that seems to be growing sideways/flopping over. The top part is fine and looks normal; just the bottom portion can’t seem to support the weight of the top and grows horizontal instead of vertically. I’ve staked it but wonder if there’s something else going on? I water it a little once a week and seems to be doing fineness on that regimen (producing pups, etc). thanks! I have a rather small aloe plant and I just had a leaf break from the cat knocking the plant over. I’m trying to find info on how to store aloe leaves. I heard you mention in a video that you store yours in the fridge. How? Do I remove the gel and store it in the fridge? The whole leaf? Or do you have a video/blog post about how to store aloe? I tried searching and couldn’t find anything. I live in Georgia where it gets relatively cold in the winter and hot as Haiti in the summer. We do, on occasion get a good bit of rain. What do yoy suggest as an optimal place to grow? I purchased my aloe plant from a retail store a year ago and it seems to be doing well in my office at work. Everyone that sees it comments on how big it has gotten and how good it looks. My question is, how old does it have to be before it starts producing pups? I would love to have more little aloe plants to grow and share!